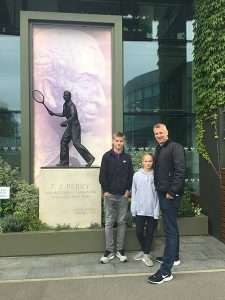 Eleven-year-old Tia Carter will represent the Royal Air Force and the RAF Benevolent Fund when she takes part in the Coin Toss Ceremony on Centre Court on Saturday, 14 July. Tia’s father Wayne serves in the RAF at RAF Brize Norton, as did her mother Joyce, who passed away suddenly in November last year (family picture above). The RAF Benevolent Fund’s flagship youth support scheme, Airplay, has been a great support to Tia as she comes to terms with the loss of her mother. Airplay is run by the RAF Benevolent Fund at RAF stations around the UK providing youth support to young people aged from eight to 18. Tia and Joshua will enjoy a tour of the Clubhouse and lunch in the Competitors’ Restaurant before the match. They will be assisted in their on-court duties by Andrew Jarett, Championships Referee. To find out more about the RAF Benevolent Fund’s Airplay programme, go online. Watch Tia on her first visit to Wimbledon.